I am giving this book 4.5 stars. 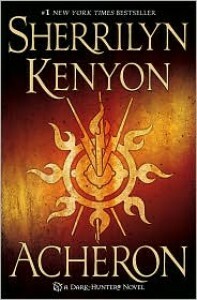 I think that the first half of the book did a really good job telling the story and the terrible hardships that Acheron had to go through in his human life. But I felt like as soon as it turned to the present day and his relationship with Tory everything felt very rushed. I wish there was more back story and connection between them before the book ended. Especially the ways that Tory found out about Acheron (his human life, being a god, bunch of other stuff) seemed very unreal, "wow your an Atlantean god? Kinda weird but okay" seemed to be her reaction to a lot of things and I found it disappointing. I was really looking forward to this book since I started the Dark-Hunter series and I really think that Acheron deserved a longer and more in depth look into his romance with Tory.